Highlands at Breck – Highlands Park is one of several filings in the Highlands at Breckenridge in Breckenridge Real Estate. Newer, luxury homes for sale in Breckenridge can be found in Highlands at Breck – Highlands Park. These Breckenridge homes can be found off of Tiger Road on either Buffalo Terrace, Long Ridge Drive, Sage Drive, Cottonwood Circle, Galena Court, Gold Run Road or Lake Edge Drive. Highlands at Breckenridge – Highlands Park is one of the last phases to be released in the Highlands at Breckenridge. Homes in this part of the Highlands have amazing views of the Ten Mile Range, the Breckenridge Golf Course and the Continental Divide. With a total of 108 parcels in Highlands at Breck – Highlands Park there are 11 lots dedicated to open space, 37 vacant lots and 60 lots with luxury Breckenridge homes. The lots range in size from 0.58 – 2.37 acres. 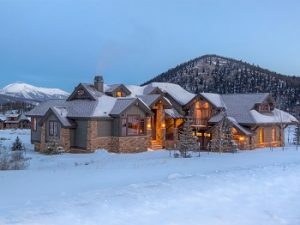 When you purchase a luxury home in the Highlands at Breckenridge there is a 1% transfer tax, this is only paid each time a property changes hands. Owning a property within the Town of Breckenridge gives the owner discounts at the Breckenridge Golf Club, Breckenridge Recreation Center and the Stephen C. West Ice Arena. Not far from the Highlands at Breck – Highlands Park area is the Breckenridge Golf Club in the summer and the Gold Run Nordic Center in the winter. Throughout the Highlands at Breckenridge there are also endless trails for hiking, biking, snowshoeing and nordic skiing. Owning a luxury home in the Highlands at Breckenridge provides access to many outdoor activities with the convenience of being just a few miles from Main Street Breckenridge. For questions about vacant land and homes for sale in Highlands at Breck – Highlands Park and all Breckenridge Real Estate call us at 970.333.9050 or inquire online.